Matilda of Scotland, born Edith in 1080, was Queen of England as the first wife of King Henry I. After William II's death in 1100, Henry, his brother, immediately seized the royal treasury and crown. His next task was to marry and his choice was Edith. After they were married on November 11, 1100, she was crowned as "Matilda," a hallowed Norman name. 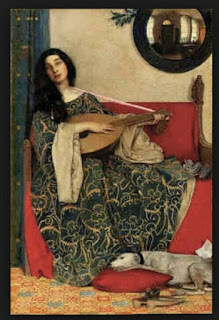 Matilda was a known patron of the arts, especially music as she was a musician herself. Her court was filled with musicians and poets. She was renowned for her devotion to religion and the poor. She would attend church barefoot at Lent, and would wash the feet and kissing the hands of the sick. She exhibited a particular interest in leprosy, founding at least two leper hospitals. She was known as a patron of the arts, especially music. Matilda died on May 1, 1118 and is buried at Westminster Abbey. After her death, she was remembered as "Matilda the Good Queen" and "Matilda of Blessed Memory." Matilda is thought to be the identity of the "Fair Lady" mentioned at the end of each verse in the nursery rhyme London Bridge Is Falling Down. Queen Matilda, wife of King Henry I, is my 28th great grandfather, according to the ancestral line of my great grandmother, Nannie Koger Boles, wife of Hige Boles.